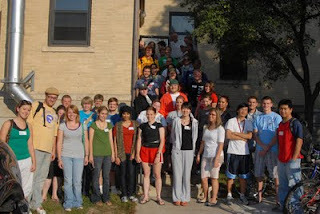 The Saint Mary's Art and Design Department hosted the first "all school" gathering on September 17, 2009. Forty students were present for announcements and information about the Art department. Refreshments were provided by the McColl family of Castle Rock Farms, and included fresh homemade bread, chili and cupcakes. Monster cookies made by the SMU Art Club. Door prizes were drawn, and included an Apple iPod (case), Andy Warhol's soup (Campbells' Chicken Noodle), and Hannah Montana hand sanitizer.